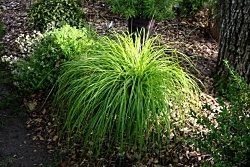 This beautiful bright green ornamental grass will brighten up a shady spot in your landscape. Perfect for a pop of color in a mixed container. Use to edge a path or patio, or plant as a groundcover.